The source for land for sale by owner! Fill Out Our Buyer Questionnaire To Get $50 Off Of Your Closing Costs! 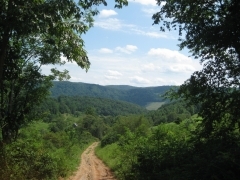 Sign up to receive info on new and featured land for sale with owner financing. FOR MORE INFO: Contact Us Here! 5.03 Acres with power and water - This tract is one of our best. It is over 5 acres with plenty of flat land to do as you wish. There are mild restrictions on this tract. They include a minimum size requirement for building but the land is still in an opt out area so there are no building codes other than electrical and septic. You still can install these yourself but they must be inspected. The reason for these mild restrictions is to keep up your investment and to hold your neighbors to the same standard. This is not a place for shed homes or shanties. There are fairly nice homes in this location that you can see will help your homes value. The bonus with this tract is there are 2 creeks on this property and evidence of deer and turkeys. The school associated with this property is Clarkrange high school that has an excellent army raider program and JROTC just won 1st place in the nation for its co-ed team. This would be an exellent place to build a home and raise kids in a perfect little community. Please complete the form below to ask a question or request a showing for this property. We will review your message and respond to you as soon as possible. Please add any additional notes or comments that we will need to know about. We do our best to make everything as accurate as we can. If there is anything in question or vital to your purchase please make sure you verify it with us before making any decisions. 19.05 rural acres with 100% Owner Financing. 1.54 Acres - Contact us for more info. 5.03 Acres - Contact us for more info. Golf course lot in Fairfield Glade community. Cul-de-sac lot overlooks fairway of golf course. There is also a stream flowing through this property. 2 Acres - Contact us for more info. 0.26 Acre building lot - Contact us for more info. 0.9 Acre building lot - Contact us for more info. 57 Acres - Only 20 minutes from Downtown Huntsville, very private, varied terrain and owner financing. 43.72 Acres - Large piece of owner financed land right outside of Huntsville Alabama with two small waterfalls and a natural pit. Additional info coming soon. Contact us to find out more before it's gone! 5 rural acres with road frontage. 0.42 Acres - Golf course lot in Fairfield Glade community. 7.5 Acres - Contact us for more info. 1.5 Acres - Contact us for more info. 2.4 Acres - Contact us for more info. 6.14 Acres - Nice owner financed land with plenty of paved frontage, power and water. 1.88 Acres - Contact us for more info. 2 Acres with financing- Contact us for more info. 1.91 Acres - Contact us for more info. Level and hilly. Walk to the lake. 9.88 Acres on Sugar Island, Michigan - Land in a very secluded location with road frontage. 49.88 Acres - Large tract of owner financed land right outside of Huntsville Alabama. Contact us for more info. 3 Acres - Contact us for more info. 5.82 acres - Contact us for more info. Well and electric already on the property. Unrestricted land in a secluded location. 4.98 acres with highway frontage on highway 27. The land also goes down to an active railway system. Many times, the best new properties go to customers who have already made contact with us. Often, even before we get pictures to put on the website. So, be sure to get in touch and let us know what you're looking for so you don't miss out on your dream property.